When the United Nations was created, its founders envisioned a different kind of world. A world in which disputes were resolved in meeting rooms and not battlefields. A world in which wars were stopped before they broke out. A world that didn’t wait for lives to be lost before springing into action. But violent conflicts are on the rise in many parts of the world today. They’re becoming more drawn out, complex and deadly. Civilians are no longer killed in cross-fire; they are now the targets of direct attacks. We are also seeing an unprecedented number of people leaving their homes, out of fear and desperation. And that is why the UN needs a new approach to peace. I will convene a High-Level Meeting on Peacebuilding and Sustaining Peace in New York on 24 and 25 April. It will bring world leaders together to focus on conflict prevention, mediation, dialogue and diplomacy. This is part of a wider effort by UN Member States to help our Organisation do better at fostering peace. And when I say peace, I’m talking about the kind of peace that can be taken for granted. The kind of peace that won’t disappear at the next election cycle. The kind of peace that is measured not in months or years, but in generations. This is what we call “Sustaining Peace”. And this is what we should be working for – rather than scrambling for solutions, once conflict has broken out. Some might say that true lasting peace is impossible in certain parts of the world. But it is not. I have seen this firsthand. When Montenegro split from Serbia, peace was not a given. In fact, some people were predicting serious violence. But through intense diplomatic efforts, and real political will, peace persevered. And it has lasted – with no signs that it will waver in the future. Last month, I travelled to western Colombia and was inspired to see indigenous communities working with the UN to build peace through strengthening social bonds. I was inspired to see villagers, some of whom had suffered through more than 50 years of war, excited about their futures. One woman told me about her people’s determination not to slide back into conflict. These are the examples of Sustaining Peace, which are taking place now – all around the world. We may have the bulk of our discussions in New York. But they should be led by experience from the ground. We need to highlight what the real peacebuilders are doing – from those running women’s peace huts in Liberia, to those organising mediation workshops in Kyrgyzstan. That’s why the High-Level Meeting will pool actors from across different countries, sectors and societies, and allow them to share their insights. Of course, it won’t matter that everyone buys into Sustaining Peace if there are no funds to make it happen. We need more investment in prevention. When conflict causes societies to collapse, social fabric tears. Buildings are destroyed, and no one fixes them. Salaries stop getting paid. Water stops flowing out of taps. So then we spend money on rebuilding – but so much more than what we’d spend on preventing conflict in the first place. Aside from the suffering that we’re failing to avert, that just doesn’t make financial sense. Increasing investment in even a handful of countries can result in billions of dollars of savings for the international community. At the end of the day, what we can’t forget is that the UN was founded for peace. That’s what its flag should stand for. Its success in preventing conflict should be the norm – not the exception. It must be the world's broker for peace. 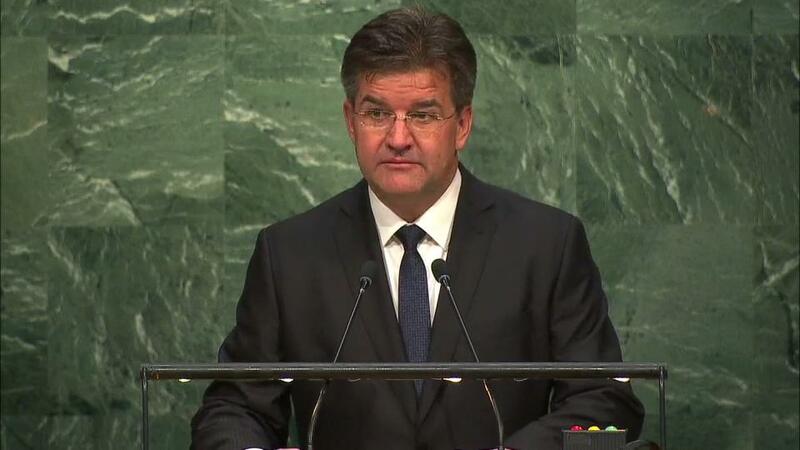 Miroslav Lajčák is the President of the United Nations General Assembly.